LAS VEGAS – FIRST Nevada Robotics announced today that five FIRST Nevada robotics teams have won the state level competition and are headed to the World Championship robotic competition in Houston, TX. The World Championships will be held from April 18 through 21. Nevada will be represented by teams from the FIRST LEGO League Jr, FIRST LEGO League, and FIRST Robotics Competition in the World Championship. Team 12712, Golden Dragons, from Carson Montessori in Northern NV will be competing at the FIRST LEGO League Jr level (K-4). Team 3031, The Lego Leaders, from Jo Mackey Magnet School in Southern NV will be competing at the FIRST LEGO League level (Grades 4-8). 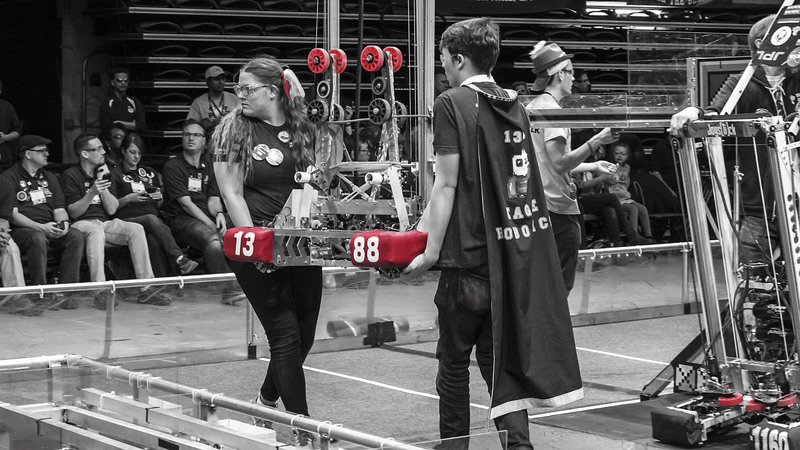 Team 987, The HIGHROLLERS, from Cimarron-Memorial High School in Southern NV will be competing at the FIRST Robotics Competition level (Grades 9-12). Team 6824, Robot Pigeons, from Las Vegas Academy of the Arts, in Southern NV will be competing at the FIRST Robotics Competition level (Grades 9-12). Team 6957, A.C.E.S., from Lake Mead Christian Academy in Southern NV will be competing at the FIRST Robotics Competition level (Grades 9-12). The winning FRC (FIRST Robotics Competition) teams competed successfully for the right to go to the Worlds, at the 2018 Las Vegas Regional FIRST® competition that was held in Las Vegas on March 22-24th. Governor Brian Sandoval attended the regional competition and was joined by FIRST Nevada lead sponsor Switch’s founder and CEO Rob Roy, Switch CIO Missy Young and a host of Switch executives, who all demonstrated hands-on support for Nevada’s teams. The FIRST Championship will be held across two cities: April 18-21 at the George R. Brown Convention Center in Houston, Texas, and April 25-28 at the Cobo Center in Detroit, Michigan. The events, which will bring in more than 60,000 spectators and students, and have an estimated economic impact of $30 million to each of the 2018 host cities.